I was traveled to my Mother In Law's in Michigan this past May. It was a hot and sunny weekend. 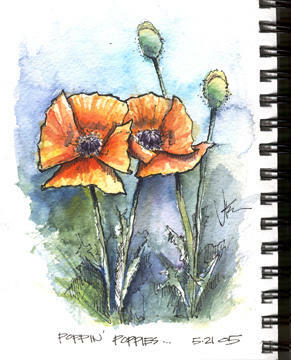 She has a section in her backyard that had bright orange poppies in bloom. The colors were bright and vibrant. I pulled out my trusty watercolor sketch journal and went into action. Doing quick line drawings and throwing watercolor on them is such a great pleasure. 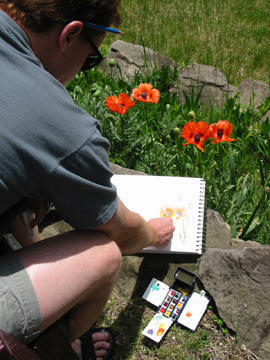 Here is a shot of me in the act of sketching "Poppin' Poppie". The title does not having anything to do with personal hygiene or the flying insects that are found on your local neighborhood dog dropping. 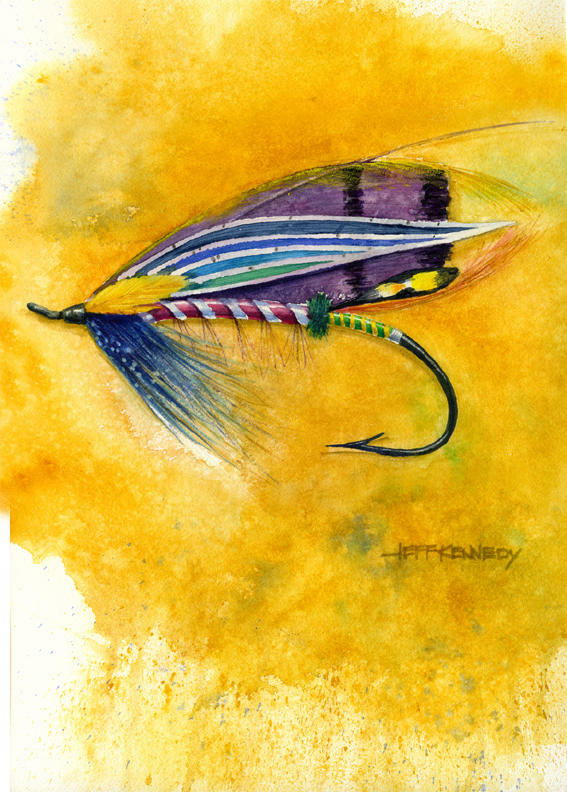 It has to do with the subject that got me started in watercolor....fly fishing salmon flies. I love the colors and shapes of the traditional salmon fly. I have not painted any in a while, and I need to get back to doing a few. I may even try some new techniques to keep things fresh. With the dizzying variety of writing instruments available today, I have found a different and fun way to inject some personality and fun into my sketches. Instead of using my ever growing inventory of pens, I will use some unconventional tools to make a mark. These include a bamboo pen, sharpened sticks and carved Popsicle sticks. Simply find some suitable twigs, grab your trusty pocket knife and carve away. 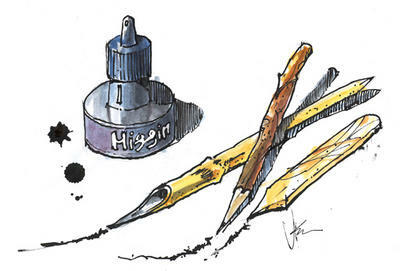 To make my marks, I dip the end of the sharpened stick into a bottle of waterproof India ink. Sure it is messy and you have to keep dipping the stick, but the varying line width you achieve is worth the effort. Using a waterproof ink allows me to come back and add watercolor to the sketch without dissolving the lines. Bottled ink is available in different colors, so you are not bound to produce line work in black. Sometimes while using these writing instruments, you may get stray marks, blobs and if you are lucky even a spatter or two. These types of marks are welcome in my sketches and make them that more special. If you want to get real loose, try drawing with a stick that is a foot long and hold it at the very end. In a black and white sketch, obviously line is the dominant element. Using a pen with a precise size nib leaves little room to vary your line width. One way to get a varying line is to twist and contort the pen or use the side of the nib to achieve a varying affect. One can also achieve this affect by using various sizes of pen nibs and retrace over existing line work. The line is an all-purpose tool which can be used in a variety of ways to sketch. Hopefully stepping outside the box and sketching with something other than the trusty pen or pencil will add a new spontaneity to your sketches. This post originally appeared on www.thedrawingclub.net .